More than 4,000 years ago, when the Great Pyramid of Giza and Stonehenge were being built, the Maya civilisation emerged in Central America. The indigenous group prospered for thousands of years until its fall in the 13th century (potentially due to severe drought). However, thousands of years before this collapse, severely soggy conditions lasting for many centuries likely inhibited the civilisation’s development, according to a recent study published in EGU’s open access journal Climate of the Past. During their most productive era, often referred to as the Classic period (300-800 CE), Maya communities had established a complex civilisation, with a network of highly populated cities, large-scale infrastructure, a thriving agricultural system and an advanced understanding in mathematics and astronomy. However, in their early days, dating back to at least 2600 BCE, the Maya people were largely mobile hunter-gatherers, hunting, fishing and foraging across the lowlands. Around 1000 BCE, some Maya communities had started to transition away from their nomadic lifestyles, and instead were moving towards establishing more sedentary societies, building small villages and relying more heavily on cultivating crops for their sustenance. However, experts suggest that agricultural practices didn’t gain momentum until 400 BCE, raising the question as to why Maya development was delayed for so many centuries. 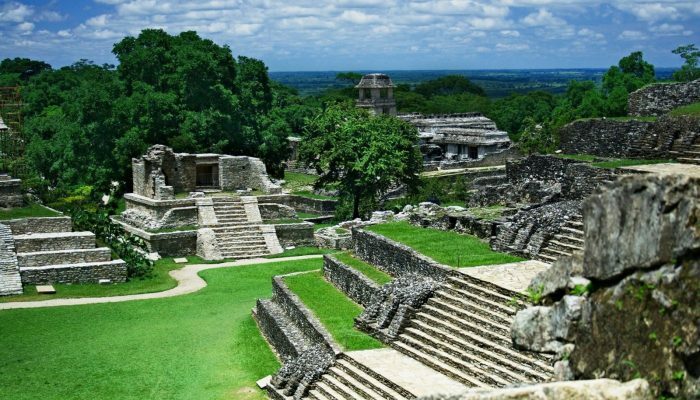 By analysing two new palaeo-precipitation records, Kees Nooren, lead author of the study and a researcher at Utrecht University in the Netherlands, and his colleagues were able to gain insight into the environmental conditions during this pivotal time, and the impact that climate change could have had on the Maya society. 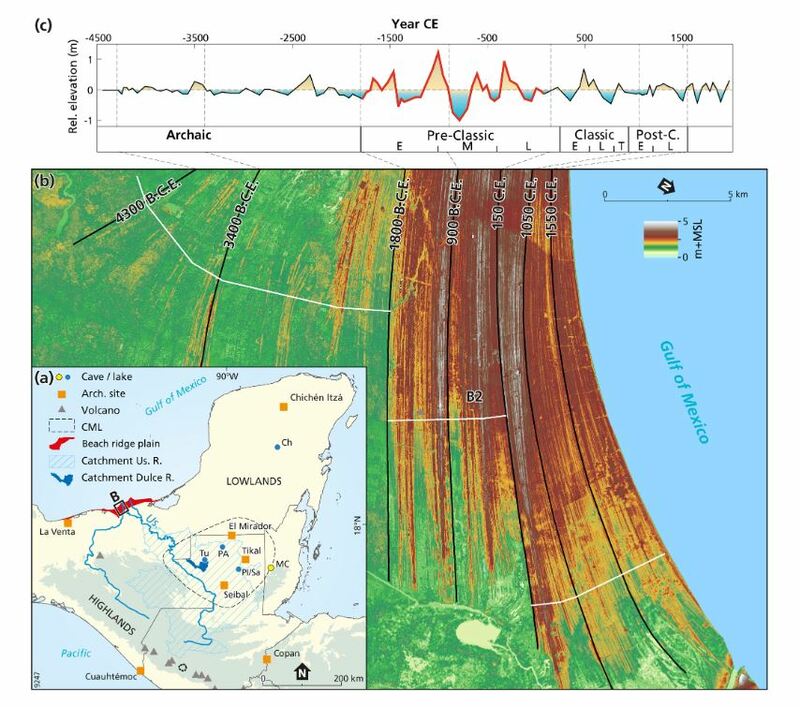 To determine the regional climate conditions during this period of time, the authors examined a beach ridge plain in the Mexican state of Tabasco, off the Gulf of Mexico, which contains a long-term record of ridge elevation changes for much of the late Holocene. Since precipitation has a large influence on the elevation of this beach ridge, this record is a good indicator of how much rainfall and flooding may have occurred during Maya settlement. Additionally, the researchers also assessed core samples taken from Lake Tuspan, a shallow body of water in northern Guatemala that is situated within the Central Maya Lowlands. Because the lake receives its water almost exclusively from a small section of the region (770 square kilometres), its sediment layers provide a good record of rainfall on a very local scale. The research team’s analysis suggested that, starting around 1000-850 BCE, the region shifted from a relatively dry climate, to a wetter environment. Such conditions would have made a farming in this region more difficult and less appealing compared to foraging and hunting. The researchers suggest that this change in climate could be one of the reasons why Maya agricultural development was at a standstill for such a long time. The researchers also propose that this long-term climate trend could have been brought on by a shift of the Intertropical Convergence Zone (ITCZ), a region near the equator where northeast and southeast winds intermingle and where most of the Earth’s rain makes landfall. The position of this zone can move naturally in response to Earth’s changes in insolation, and a northerly shift of the ITCZ could help account for some of the morphological changes the authors observed in the precipitation records. After more than 450 years of excessive rainfall and large floods, the records then suggest that the region experienced drier conditions once again. By this time period, the Maya populations began to rapidly intensify their farming efforts and develop major cities, further suggesting that the wet conditions may have helped delay such efforts. This is not the first time the Nooren and his colleagues have found evidence of major environmental influence on the Maya civilisation. 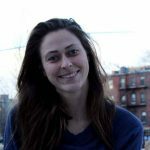 For example, earlier research led by Nooren suggests that, in the 6th century, the El Chichón volcano in southern Mexico released massive amounts of sulfur into the stratosphere, triggering global climate change that likely contributed to a ‘dark age’ in Maya history for several decades. During this time, often referred to as the “Maya Hiatus,’ Maya societies experienced stagnation, increased warfare and political unrest. The research results were presented at the 2016 General Assembly and later published in Geology. The results of these studies highlight how changes in our climate have greatly influenced communities and at times even shaped the course of societal history, both for better and for worse.